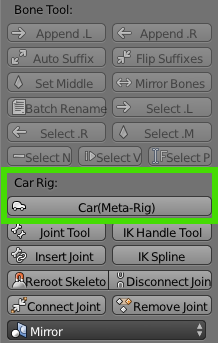 Addon automatically create rig for car ready for animations. Hmm…just a five bone armature generator. Nothing to do steering or rolling yet? Atom: It is like rigify. Place the bones as you need and then press generate in objectData. sorry: I can not add more links because I need at least 10 posts. Nice job, it seem to be very nice. I watched the video, but I didn’t test it yet. I wanna know, how is handled the collision? is the collision generated automatically?? Yes collisions are automatic. Each wheel has already prepared shrinkwrap modifier. So just write the name of the surface. I tried it again and I still don’t get any joy out of this. So I run the script ALT-P. 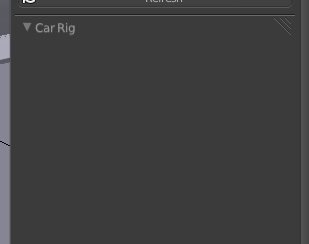 In the 3D view I press SHIFT-A and add the car rig under the armature menu. Then I activate the Armature Object Data context and scroll to the bottom. I see a big button Generate so I click it. Now what? The rig does not roll or steer. I hope that will help you picture. thanks for sharing. Checked out your youtube stuff, Skoda Felicia eh? Nope, no smart comments, had one for 10 years, loved that car! Tried the car rig script. I keep getting the axis bone skewed in edit mode but in pose and object mode its looking good. Why is the axis bone skewed in edit mode? How to solve this. Is the script not working in Blender 2.65a? Solved the problem by selecting the Axis bone in edit mode and with Ctrl+R rotate in good position. oh friends, wat a time consuming problem… i watched every tutorial about car rigging and animation, and i found this car rig here very handy… but… in every case i have a problem with my path… the car is moving und turning but in the first half of the path, the wheels are turning good and when i drive over to the last half of the path, the wheels became slowing down and smoothly they going over to turn backwards… then i changed the origin of the path, because i grabbed all points in positiv x and y positions, but the same problem… also the scale and rotation of all objects i have applied… no solution?! i cant change the the wheel dimension, i dont see the settings in the panel. Thanks for the head up! After a long night I finally found how to do it manually. I never really did animations or much rigging. After studying it a bit I found that I could change it under xeuler and set it a bit higher. I also tried to rig every thing again and than noticed i did could add the wheel size. Cause I was just free styling on it never tea this complete thread and so I saw the image with the panel later. When the armature is generated the option of the wheel size isn’t visible anymore. Thanks, but looks exactly the same. One did a copy of the other as it looks.